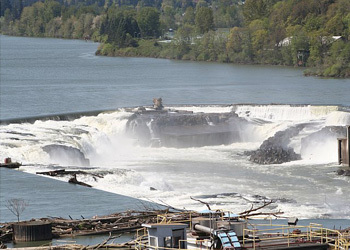 Fish counting through Willamette Falls fishway occurs at the main viewing window. Video cameras and time lapsed video recorders are used to record fish passage 24 hrs/day, 365 days/year. Our schedule for reviewing the tapes is Monday through Friday. It takes most of the day to accurately review one day of fish passage on tape when the counts are high. We make every attempt to keep the counts as up-to-date as possible. Keep in mind, that Monday's are extremely busy for us, as we attempt to catch-up with the weekend counts. Occasional changes in work schedules due to holidays and video equipment problems may also result in delays to our fish counting schedule. In an attempt to provide the latest counts possible, we may skip forward a few days. This leads to gaps in the counts and an inability to provide cumulative totals. However, to maintain accuracy, we count the skipped days and provide cumulative totals on proceeding days.